Have a question for Palazzo Hotel? "Staff is nice check in easy." "5 min walk to Metro staff friendly and helpful Bad-surrounding no shopping mall." "The location is sooo good." "Good location, clean and nice room." Enriched by a tradition of warm hospitality, Siam's friendly smiles provide the initial proof that your visit to Thailand, the Land of Smiles, will be one of life’s most memorable experiences. It is the nation’s great pleasure to be your host. 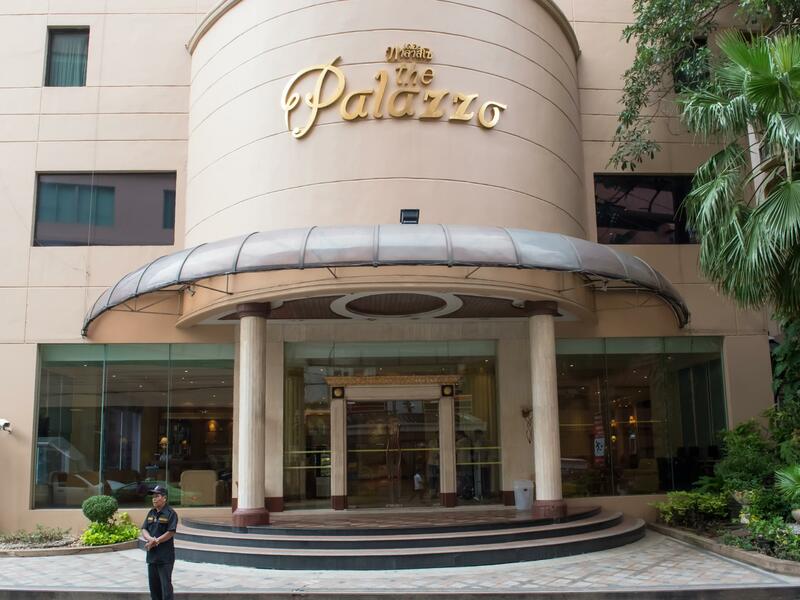 Palazzo Hotel is strategically located on Ratchadapisek Road, one of Bangkok’s new main commercial districts. The hotel is easily accessible to other main roads and local attractions. The property is adjacent to the Thai Cultural Center, the Export Department Center, and Queen Sirikit National Convention Center. It is ideally positioned for access to shopping centers, superstores, and nightlife. To proceed with your reservation at Palazzo Hotel, simply enter your dates of stay and submit our secure online booking form. Hotel is 5 mins walk to the huai kwang train station. 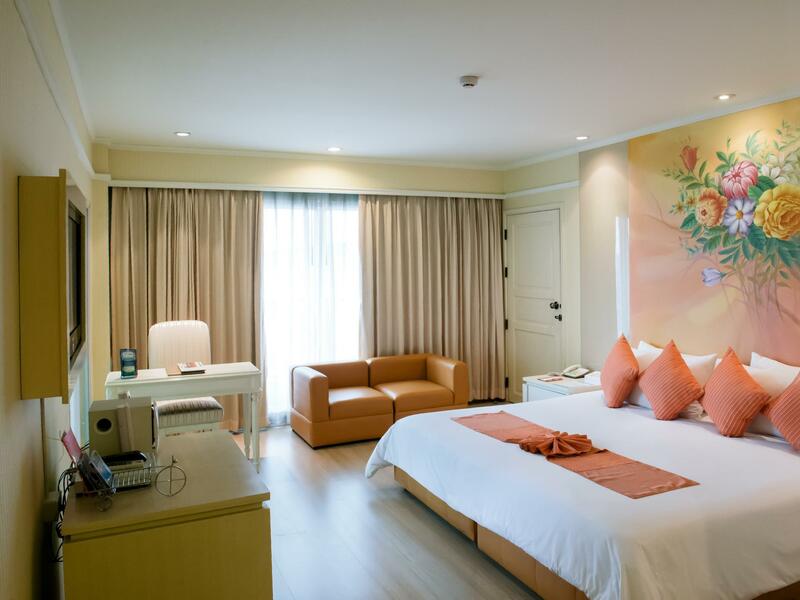 From the airport you cab take the train and go down to makkasan station, walk 5 mins to transfer at phechaburi station to go down to huai khwang station. When you get off go on exit (i forgot the number) look at the sign where it says exit is going to emerald hotel. It is just one station to Thailand Cultural Center wherein at the back of esplanade there is a very big night market. Can go easily at chatuchak weekend market. Clean hotel. I would probably stay here again. Staff is nice check in easy. The rooms are pretty warn and we had the studio rooms, the bathroom shower is at an odd height and low volume never got hot, it leaks on to the floor a lot! Food is ok eatable but not terrific. Bed is hard but for us felt good. Area has good food and 3-5 min walk to BTS station. The value for rooms was amazing you would pay 3-4 times as much next door. I would stay here 1-3 days if needed. The price is not expensive and i was given an upgrade to suit room when checking in. it is convenient if you are driving yourself but the car park is limitation at hotel and might need to park far. The hotel mostly with the guess from group's travellers, Breakfast are simple. 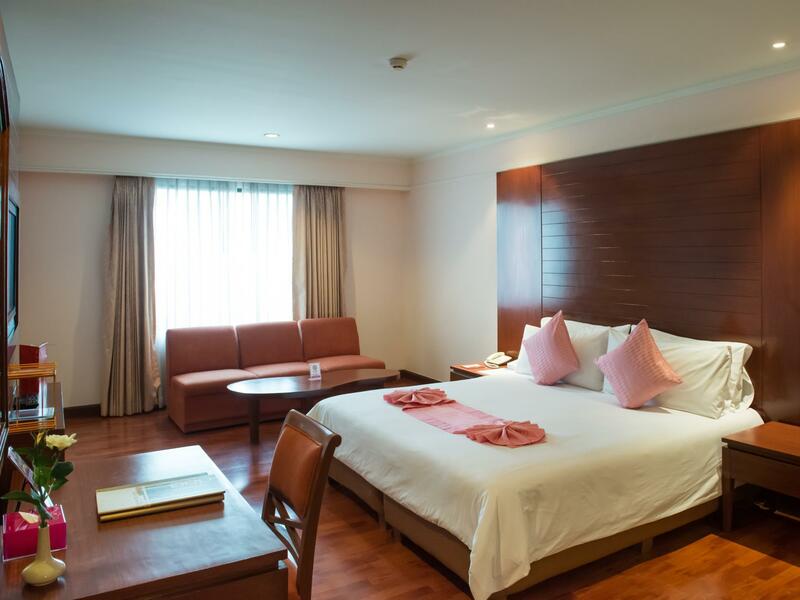 It is near to Ratchada night market around 1km, convenient you have own transport. Many massage center around. This hotel is very special to me. I always come here first when visiting. My favorite staff. So nice and accommodating! Thank you Palazzo B ! the neighborhood is a great location. You can find what you need and so close to the MRT. Great shopping and food ...everything. 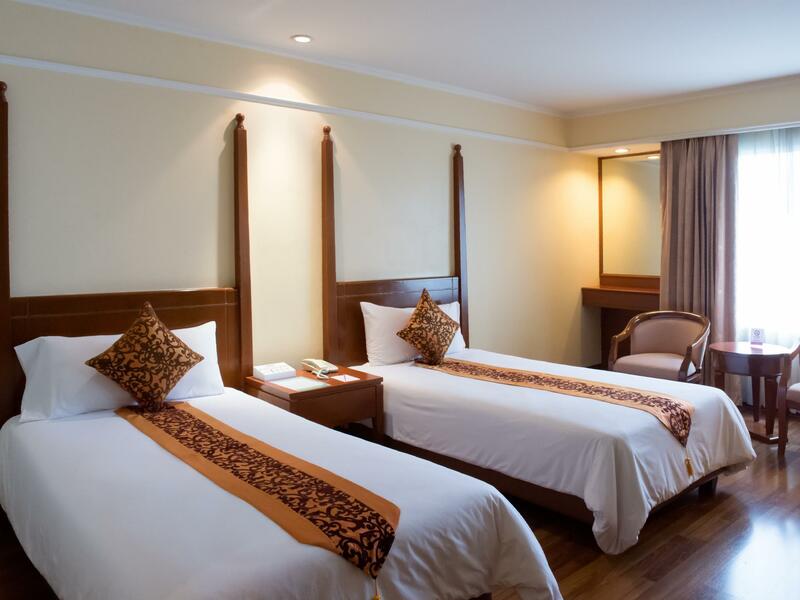 Less than 10 minutes walk to nearest BTS Huy Kwang station. The hotel location is not at main Street , but is safe to walk in the night . The location is less than 300 m behind Emerald Hotel. The morning breakfast is well spread . Morning was crowded in the last 3 days probably due to seminar going on. The hot shower has no issue . The problem is the toilet flushing system. Probably , the management need to make good the pump. Overall stay is ok .
No Security Deposit in the room was the only complain. I had to use safety deposit box behind the front desk. The safety was too small to hold my notebook. So I let it witk the front desk. Palazzo Hotel had always been my choice in term of location and pricing. Short walk to Huay Kwang mrt station and with the market round the corner with aplenty food choices. Had not firmed up on a one night lodging back to bangkok. After seeing the deal on offer on Agoda for Palazzo hotel, cannot resist but to book it. The hotel still has some rooms with bathtub, if you don't like bathtub let them know. Love the breakfast spread oriental and English style. Coffee is well done too. I have stay in baiyoke hotel before and it just sux have to wait for lift going to breakfast and lots of waiting. Is my third time staying in palazzo . 7 eleven is just a stone throw away. Not so crowded as city area and is just 20 mins from the airport. Near to hwai Kwang MRT . 1) 7 eleven is just opposite the hotel. 2) Room is big and clean. 3) Water temperature has been improved for the bathroom. Not my first time in Palazzo Hotel, the only improvement is the water temperature is much better than last time. Unlike last time it is either too hot or too cold. The only thing to improve is really the air-conditioned. It isn't cold enough and condenser is too noisy still. I am hoping Palazzo will improve on this issue soon. Recommend Palazzo for the location and friendly staff. Thumbs up! Very pleasant. 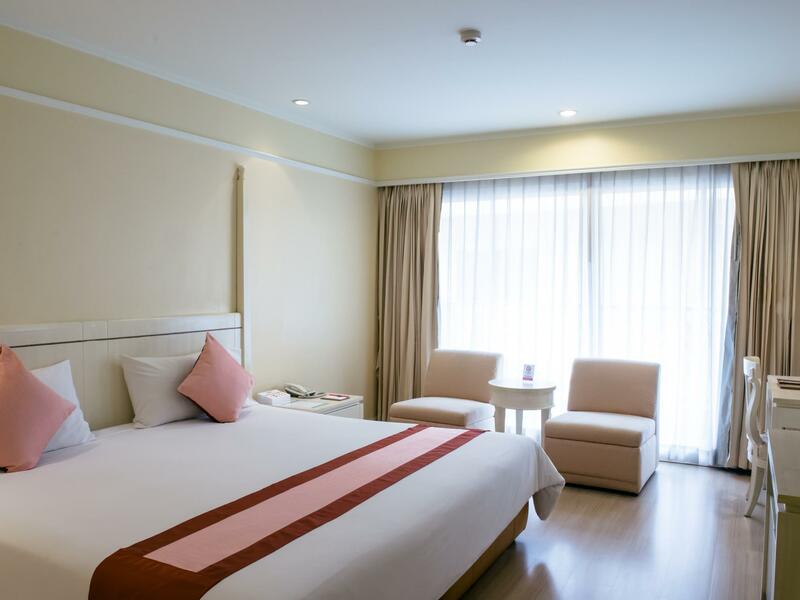 Rooms come equipped with DVD player, very clean rooms, good pillows - one soft and one hard, hot water system is consistent and staff are friendly. Minor setbacks are the shower hose is not long enough for a taller person, shower gel is inadequate and the dressing table is too small if you need to work on your computer. Overall, its an excellent hotel. The breakfast was really nice with a wide range of selections. I can easily spend more than 1.5 hours there. The location is nice. There is a night market just 5-min away on foot. It is near Hwai Khwang MRT station. It was nice and comfortable stay always, every time I come to Bangkok I would choose this hotel. There is train station a stone throw away, very convenient. I really like the surroundings and enjoyed my stay there.